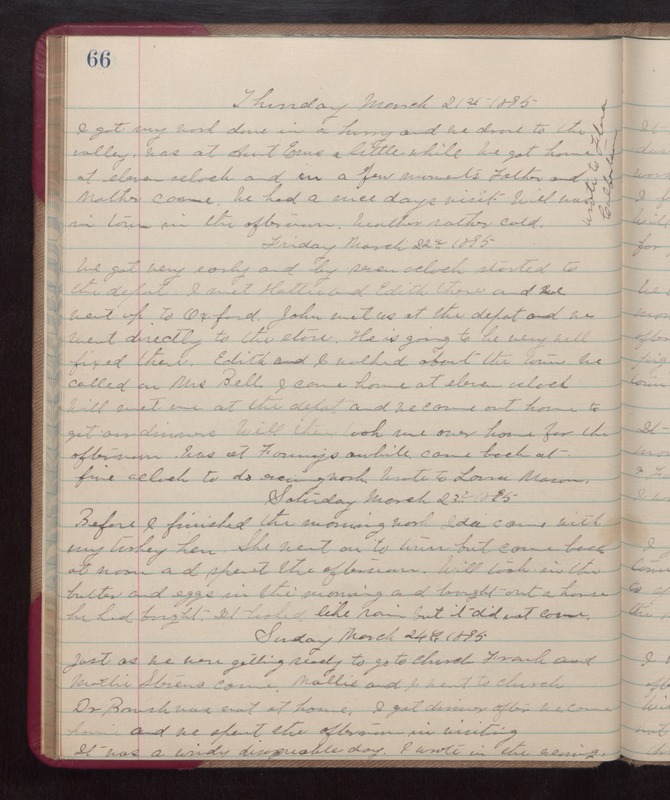 Thursday March 21st 1895 I got my work done in a hurry and we drove to the valley. was at Aunt Ems a little while. we got home at eleven oclock and in a few moments Father and Mother came. We had a nice days visit. Will was in town in the afternoon. weather rather cold. [the following text is written vertically in the right margin of the above entry] wrote to Flora Culbertson. Friday March 22nd 1895 We got very early and by seven oclock started to the depot. I met Hattie and Edith there and we went up to Oxford. John met us at the depot and we went directly to the store. he is going to be very well fixed there. Edith and I walked about the town. we called on Mrs Bell. I came home at eleven oclock. Will met me at the depot and we came out home to get our dinners. Will then took me over home for the afternoon. was at Fanny's awhile came back at five oclock to do evening work. wrote to Laura Mason. Saturday March 23rd 1895 Before I finished the morning work Ida came with my turkey hen. She went on to town but came back at noon and spent the afternoon. Will took in the butter and eggs in the morning and brought out a horse be had bought. It looked like rain but it did not come. Sunday March 24th 1895 Just as we were getting ready to go to church Frank and Mattie Stevens came. Mattie and I went to church. Dr. Brush was not at home. I got dinner after we came home and we spent the afternoon in visiting. It was a windy disagreeable day. I wrote in the evening.